16:9 (1.77:1 = 42:32) is an aspect ratio with a width of 16 units and height of 9. 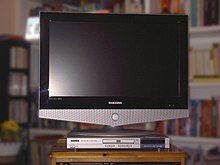 Since 2010 it has become the most common aspect ratio for televisions and computer monitors, and is also the international standard format of HDTV, Full HD, non-HD digital television and analog widescreen television. This has replaced the old 4:3 aspect ratio. The main figure shows 4:3, 5:3, 1.85:1, 2.2:1 and 2.35:1 rectangles with the same area A, and 16:9 rectangles that covers (black) or is common to (grey) them. The calculation considers the extreme rectangles, where m and n are multipliers to maintain their respective aspect ratios and areas. Dr. Kerns H. Powers, a member of the SMPTE Working Group on High-Definition Electronic Production, first proposed the 16:9 (1.77:1) aspect ratio in 1984  when nobody was creating 16:9 videos. The popular choices in 1980 were: 1.33:1 (based on television standard's ratio at the time), 1.66:1 (the European "flat" ratio), 1.85:1 (the American "flat" ratio), 2.20:1 (the ratio of 70 mm films and Panavision) and 2.35:1 (the CinemaScope ratio for anamorphic widescreen films). Powers cut out rectangles with equal areas, shaped to match each of the popular aspect ratios. 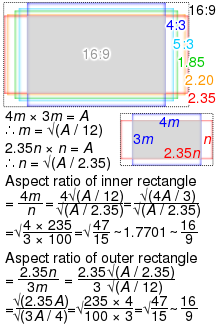 When overlapped with their center points aligned, he found that all of those aspect ratio rectangles fit within an outer rectangle with an aspect ratio of 1.77:1 and all of them also covered a smaller common inner rectangle with the same aspect ratio 1.77:1. The value found by Powers is exactly the geometric mean of the extreme aspect ratios, 4:3 (1.33:1) and 2.35:1 (or 64:27, see also 21:9 aspect ratio for more information), √47/15 ≈ 1.770 which is coincidentally close to 16:9 (1.77:1). Applying the same geometric mean technique to 16:9 and 4:3 yields the 14:9 aspect ratio, which is likewise used as a compromise between these ratios. In 2008 the computer industry started switching to 16:9 from 4:3 and 16:10 as the standard aspect ratio for monitors and laptops. A 2008 report by DisplaySearch cited a number of reasons for this shift, including the ability for PC and monitor manufacturers to expand their product ranges by offering products with wider screens and higher resolutions, helping consumers to more easily adopt such products and "stimulating the growth of the notebook PC and LCD monitor market". In 2011 Bennie Budler, product manager of IT products at Samsung South Africa, confirmed that monitors capable of 1920×1200 resolutions aren't being manufactured anymore. "It is all about reducing manufacturing costs. The new 16:9 aspect ratio panels are more cost-effective to manufacture locally than the previous 16:10 panels". Since computer displays are advertised by their diagonal measure, for monitors with the same display area, a wide screen monitor will have a larger diagonal measure, thus sounding more impressive. Within limits, the amount of information that can be displayed, and the cost of the monitor depend more on area than on diagonal measure. DVD producers can also choose to show even wider ratios such as 1.85:1 and 2.39:1[a] within the 16:9 DVD frame by hard matting or adding black bars within the image itself. Some films which were made in a 1.85:1 aspect ratio, such as the U.S.-Italian co-production Man of La Mancha and Kenneth Branagh's Much Ado About Nothing, fit quite comfortably onto a 1.77:1 HDTV screen and have been issued as an enhanced version on DVD without the black bars. Many digital video cameras have the capability to record in 16:9. In Europe, 16:9 is the standard broadcast format for most TV channels and all HDTV broadcasts. Some countries adopted the format for analog television, first by using the PALplus standard (now obsolete) and then by simply using WSS signals on normal PAL broadcasts. Azerbaijan All channels (except Lider TV). Belarus All channels (except VTV, BelMuzTV, TV-3 Belarus). Bosnia and Herzegovina All channels. Croatia HRT 1**, 2**, 3**, 4**, 5, RTL Televizija*, RTL 2*, Nova TV*, Doma TV*, RTL Kockica* Sportska Televizija**. Georgia All channels (except Rustavi 2, Ertsulovneba, Mall TV, Marneuli, Gurjaani). Italy All channels (expect TGS, Tele One and Video 66). Kazakhstan All channels (except 7 channel, STV). Moldova TRM (Moldova 1, Moldova 2), GMG Group (Prime, Canal 2, Canal 3, Publika TV), ProTV Chishinau, N4, Jurnal TV, TV8, NTV-Moldova. Monaco Télé Monte Carlo & Monaco Info. Always on 4:3 with 16:9 stretched: CNM channels (Naţional TV, Național 24 Plus, Favorit TV), TVR regional channels (TVR Cluj, TVR Craiova, TVR Iași, TVR Tîrgu-Mureș, TVR Timișoara), Prima TV. Russia All channels (except Spas, some channels from VGTRK (Russian Bestseller, Russian Detective, Cinema, Sarafan, My Planete, Live Planet, History, Mama, Mult, Ani), some channels from CTC Media (Che and CTC Love), some channels from Gazprom-Media (TNT4 and 2x2), some channels from UTH Russia (U and Disney Channel)). San Marino San Marino RTV. Ukraine All nationwide channels (except UA:PBC regional television network (UA:Ternopil, UA:Poltava, UA:Chernihiv, UA:Sumy, UA:Kharkiv), Eskulap TV, OTV, KRT, First Kiev, All News, Vintage TV, Rada TV, ChePe.Info, Glas, EWTN, Novyi Hristianskiy, Boutique TV). United Kingdom All terrestrial channels. Japan's Hi-Vision originally started with a 5:3 ratio but converted when the international standards group introduced a wider ratio of 5​1⁄3 to 3 (=16:9). Hong Kong All major channels since digital television broadcasting started in 2007. Indonesia 16:9 native*: Kompas TV, BeritaSatu TV**, CNN Indonesia**, MetroTV, Trans7, Trans TV, CNBC Indonesia**, NET. *Channels that are primarily broadcast in 16:9 sometimes are filled by 4:3 content which are either stretched or pillarboxed. ***Channels in this category broadcast in 16:9 HDTV along with inner 4:3 SDTV. Due to their visibility, some contents are either pillarboxed and windowboxed (especially in commercial ads and live sport games). Contents wider than 16:9 are usually letterboxed. They're usually stretched in SDTV mode. HD versions are limited to pay-TV services. ****These channels are still using 4:3 configuration. Stretched when broadcasting in 16:9 format. Some channels have limited original 16:9 video contents. Note: Nationwide TV channels listed above are classified according to their original configuration, sorted chronologically according to TV configuration update. Configuration for exclusively digital and local channels are may vary. Local version of nationwide channels may be different to their national version. National Broadcasting Network (Lebanon). Its in HD and has no 4:3 content Future Television. Mongolia MNB & MN2, TM Television, TV5, TV6, TV8, Channel 25, Эx Орон, SBN, ETV, MNC, Eagle News TV, Edutainment TV, Star TV, SPS, Sportbox and SHUUD TV. *channels that are squeezed/letterboxed to 4:3 on analog terrestrial transmissions nor no letterbox on widescreen-produced programs. **channels that are originally broadcasting in 4:3 on analog terrestrial, but upscaled or stretched to 16:9 for digital terrestrial television, cable and satellite. ***16:9 versions available on pay-TV services only. United Arab Emirates All channels. Vietnam All of VTC HD's channels, VTV channels, HTV channels and K+'s channels (selected programmes), some local channels. Mexico Free-to-air television: Las Estrellas, FOROtv, Canal 5, Gala TV, Televisa Regional, Azteca Uno, Azteca 7, a+, adn40, Imagen Televisión, Excélsior TV, Canal Once, Canal 22, Una Voz con Todos, Teveunam, Milenio Televisión, Multimedios Televisión, Teleritmo, and some local stations broadcast HD signal. Pay television: U, Golden, Golden Edge, TL Novelas, Bandamax, De Película, De Película Clásico, Ritmoson Latino, TDN, TeleHit, Distrito Comedia, Tiin, Az Noticias, Az Clic!, Az Mundo, Az Corazón, Az Cinema, 52MX, TVC, TVC Deportes, Pánico, Cinema Platino, Cine Mexicano. United States Almost all channels on free-to-air television (especially HD Feeds). SD feeds (usually found on pay television) are usually letterboxed and downscaled to 4:3. Egypt ERTU Channel 1, ON E, ON Drama, ON Sport, ON Sport 2, DMC, DMC Drama, CBC, CBC Drama, CBC Sofra, Extra News, Al Nahar One, Al Nahar Drama, Al Nahar Sport, TeN, Al Hayah, Al Hayah 2, Al Hayah Musalsalat. ^ "Understanding Aspect Ratios" (Technical bulletin). The CinemaSource Press. 2001. Retrieved 2009-10-24. ^ Baker, I (1999-08-25). "Safe areas for widescreen transmission" (PDF). EBU. CH: BBC. Archived from the original (PDF) on 2010-10-11. Retrieved 2009-10-27. ^ "Television in the 16:9 screen format" (legislation summary). EU: Europa. Retrieved 2011-09-08. ^ "Product Planners and Marketers Must Act Before 16:9 Panels Replace Mainstream 16:10 Notebook PC and Monitor LCD Panels, New DisplaySearch Topical Report Advises". DisplaySearch. 2008-07-01. Retrieved 2011-09-08. ^ "Widescreen monitors: Where did 1920×1200 go? « Hardware « MyBroadband Tech and IT News". Mybroadband.co.za. 2011-01-10. Retrieved 2011-09-08. ^ "Steam Hardware & Software Survey". Steam. Retrieved 2011-09-08.